Tongue, Mucosa - Fibroepithelial polyp in a male B6C3F1 mouse from a chronic study. There is a small polypoid mass at the lateral margin of the tongue (arrow). 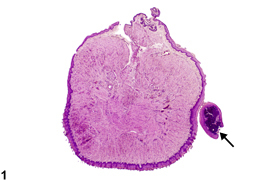 Tongue, Mucosa - Fibroepithelial polyp in a male B6C3F1 mouse from a chronic study (higher magnification of Figure 1). The polyp is composed of fibrous connective tissue, which is mineralized in this case, and squamous epithelium. Benign polypoid lesions consisting of a nodular growth of well-differentiated squamous, sometimes hyperplastic, epithelium supported by fibrous stroma occasionally occur in rodents. These lesions are continuous with the tongue mucosa, although the attachment site is often not in the plane of section ( Figure 1 and Figure 2 ). The lamina propria supporting the epithelium is often mineralized. These lesions must be differentiated from papillomas, which are considered to be benign neoplasms. Papillomas are composed of squamous epithelial cells that exhibit marked acanthosis, hyperkeratosis, and a papillary growth pattern, whereas fibroepithelial polyps consist of an unremarkable fibrous stroma covered by a nonpapillary layer of hyperplastic squamous epithelium. 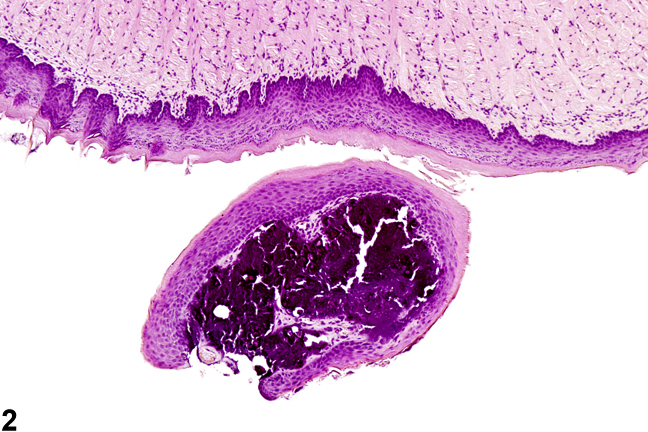 Squamous papillomas consist of three zones: a vascularized, inner, proliferative connective tissue core; a middle area of proliferating stratified squamous epithelium with well-defined basal cells; and an outer surface of keratin. As with papillomas, the attachment site for fibroepithelial polyps frequently is stalklike. Mineralization of the stroma is common in fibroepithelial polyps, and hyperkeratosis is not typically a prominent feature. Fibroepithelial polyps are generally considered incidental findings and are not neoplastic. Whenever present, fibroepithelial polyps should be diagnosed but not graded. Any associated inflammation, if present, should not be diagnosed separately unless it is unusually severe and extends into the tongue itself. Any mineralization should not be diagnosed separately.